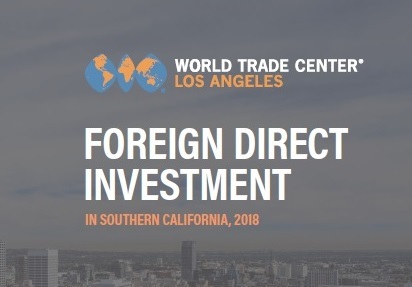 The World Trade Center Los Angeles (WTCLA) report Foreign Direct Investment in Southern California, 2018 provides details on Foreign-Owned Enterprises (FOEs) as a major contributor to employment. The report found that over 10,000 FOEs employ approximately 428,000 people in Southern California. In total, there are over 10,000 firms in SoCal that have foreign ownership, employing approximately 428,000 workers in the region. The top three countries whose business investments generate employment in Southern California are; Japan (85,874 jobs), UK (63,739 jobs), Canada (40,819 jobs). While China ranked #8 on the list, jobs at firms with Chinese ownership increased 148% over the past two-year period, to 15,968 jobs. Overall, the number of foreign-owned firms increased, but the number of jobs declined slightly in Los Angeles and Orange Counties. Download from this page, or learn more HERE.